The protagonist of pittura padana in the second half of the 1300s and among the greatest painters of all time, Altichiero was no doubt trained in Verona during the lordship of Cansignorio della Scala (1340-1375), when the city had particularly close links with the Milanese court of the Visconti. This explains the gently illusionistic character of his painting, especially in his initial period, when he was most sensitive to the work of Lombard painters as seen in oratory chapels surrounding Milan (Mocchirolo, Lentate) and in illuminated manuscripts made for the Visconti (Guyron le Courtois, Paris, Bibliothèque Nationale de France, Ms. Nouv. Acq. Fr 5243). Although he was held in high esteem by early sources, above all for his decorations with subjects from ancient history, painted in collaboration with Jacopo Avanzi, in the Reggia degli Scaligeri in Verona (the palatial residence of the della Scala family, where only a few busts of Roman Emperors survive), and in the Reggia dei Carraresi, that of the Carrara family, in Padua, he is now better known for his work in the sacred realm. Before the situation was made clarified by Pietro Toesca in 1951, modern scholarship had long struggled to disentangle Altichiero’s identity from that of the Bolognese Jacopo Avanzi, erroneously regarded as no more than his collaborator but whose style has entirely independent elements. After Avanzi’s death in 1376, Altichiero, who had already given proof of his talent in the fresco of The Cavalli Family Before the Virgin (Verona, Sant’Anastasia, Cavalli Chapel, c. 1372/1376), took over the decoration of the chapel of Saint James in the Basilica of Saint Anthony in Padua (“the Santo”), under the patronage of Bonifacio Lupi, Marquess of Soragna and representative of Francesco da Carrara the Elder. As regards the timing involved here, we can benefit from a precise account book which tells us that after the start of the chapel’s construction, begun by Andriolo de’ Santis in 1372, the scaffolding used for painting the frescoes was lowered from the upper register to the lower one in the summer of 1376, a date that coincides well with what we know from another source to have been the year in which Jacopo Avanzi died. Taking over from his colleague, Altichiero painted the two lunettes the former had left unfinished (Saint James’ Body Carried to the Castle of Queen Lupa and The Baptism of Lupa), and then, changing the language of the whole project, carried out the frescoes on the lower register (The Dream of King Ramiro, the King in Council and the Battle of Clavijo, the Resurrection, and votive frescoes on the tombs of Bonifacio Lupi and Caterina dei Franceschi). The posthumous stories of Saint James provide the occasion for an allusion to the contemporary political situation, and for paying homage to Francesco da Carrara. At the same time, Altichiero’s use of naturalistic details and the grandeur of his illusionistic conception, enabling the spectacle of the Crucifixion to extend beyond a fictive loggia, laid the groundwork for the experiments carried out in the subsequent century by artists such as Andrea Mantegna and above all Giovanni Bellini. After having painted the scenes mentioned above, in 1379 Altichiero received the entire balance owed to him. In the same year Raimondino Lupi commissioned him to decorate the oratory of Saint George, facing the churchyard in front of the Santo, with Stories of Christ and Saint George, Catherine and Lucy. The project, once considered to have been partly painted by Avanzi, was to continue until 1384. Given the conspicuous dimensions of this interior, which was made to contain Raimondino’s tomb monument (now dismembered), Altichiero now expresses himself through formal grandeur and a close resonance with the works Giotto had painted in Padua at the beginning of the century. The mellow impasto seen in the frescoes in the chapel of Saint James in the Santo was now succeeded by a markedly graphic approach, sometimes unjustly credited by scholars to the work of collaborators. Bonifacio Lupi once again turned to him in 1384 for a small panel to be given as dowry to Margherita, daughter of Corradino Lupi (now lost). Other traces of his work survive in Verona, though not all scholars are agreed in assigning his authorship to the great Crucifixion in the transept of San Zeno. The last known record of him is a posthumous Mantuan document of 1393 which speaks of the design he had provided for a Crucifix in precious metal. Evidence of his versatility appears in the illuminations modern scholarship has attributed to him in three manuscripts of Petrarch’s De viris illustribus (Paris, Bibliothèque Nationale de France, mss. Lat. 6069 F, 6069 G and 6069 I), written and decorated for Francesco da Carrara. Tempera and gold on wood panel – 38 3/16 x 19 9/16 in (97 x 49.7 cm). settentrionale dal Trecento al Cinquecento, Turin: Umberto Allemandi, 1988, pp. 11-12, fig. 7). A work of extraordinarily regal impact, this painting has been known to scholars since its publication by Federico Zeri in 1958, when it formed part of the Bossi-Hazon collection in Bergamo. It recently reappeared on the art market and was the subject of a careful cleaning by the Studio Scarpelli in Florence, which retrieved the original paint layer as much as possible, revealing its beautiful execution. The Madonna is seated on a throne, enclosed on three sides, and holding the Child who reaches downwards, suggesting a gesture of welcoming directed at a donor who would originally have been depicted kneeling in an adjacent panel. It is thus possible that the painting constituted the central section of a monumental triptych, perhaps with an arched top: while three sides of the panel still show the margin of the painted area that would have accommodated the rabbet of the frame, the topmost side appears cropped, and it is therefore hard to determine how it originally terminated. The architectural structure of the throne, decorated with perforations and foliate elements on its upper part, only reveals some of the background, which does not bear the traditional gold leaf surface but is painted blue – a rare but not exceptional solution, especially in the painting of the Po Valley region. A slight wearing of the paint surface can be noted above all in the face of the Virgin, the consequence of old cleanings. The Child’s face can be appreciated with perfect legibility, revealing the ingenuous, infantile sorrow of his downward gaze. The Virgin is dressed in a dark blue cloak, fastened across her breast by a clasp in gilded stucco, and adorned along its hems by decorative motifs applied in shell gold. During conservation the same kind of decoration was partly recovered on her robe, which is of a delicate lilac colour. Admirable, too, is the way the fabric folds around the belted area under her breasts. The Child wears a little transparent robe that falls in soft folds over his abdomen, under a carmine red mantle. A small branch of coral hangs from his neck, and he holds a rose in his left hand, both emblems relating to his Passion. His Mother’s hands firmly support him on his side and legs, impeding him from falling as he almost loses his balance while leaning downward. When he published the painting for the first time, Federico Zeri admired it greatly, asserting that it belonged to “the extremely rare group of works on panel in the immediate circle of Altichiero”. Elaborating his thoughts, the scholar believed it could be attributed “in all likelihood to the author of the polyptych from Boi di Caprino, now in the Museo del Castelvecchio, in Verona”, not without appreciating “the nuanced softness of the Child’s face, which is worthy in every way of being equated with the frescoes by Altichiero (and ‘Avanzo’) in the Chapel of Saint James in the Santo, or with the adjacent ones in the Oratory of Saint George” in Padua. Since it could only be judged by the modest black and white reproduction provided by Zeri, the prestigious panel soon vanished from the literature, and was not referred to even in the most recent studies on the Boi polyptych. For this very reason its reappearance now prompts a more thorough investigation, which – bearing in mind the results of recent conservation – cannot avoid this hypothesis: the painting is a fully autograph work by Altichiero himself. Apart from our awareness of its undoubted quality, such a recognition involves a re- examination of the painter’s critical history, which is useful for a study of the layers of prejudice that have settled into the reconstruction of his oeuvre. The full recovery of Altichiero’s identity, which has only taken place in relatively recent years, has certainly re-established his role as a painter of frescoes, but it has also left unresolved the question of his activity as author of panel paintings, which would have been no different from that of any other artist in that period: we know, for instance, of a payment made in Padua by Bernardino Lupi in 1384 (the year he received final payment for the frescoes in the Oratory of Saint George), for an “anchona [panel] purchased from Master Altichiero for Margaret”. Thus, if we have become used to sharing Pietro Toesca’s opinion regarding mural painting – that in the second half of the 1300s Altichiero was capable of shifting the balance of artistic power from Tuscany (which had dominated the first half of the century) to the Po Valley – modern scholarship has neglected his painting on panel in equal measure, with the result that the few panels reflecting his culture that survive today have never been given a comprehensive analysis. True, these vary in quality and scope, and in some instances they have also been more convincingly ascribed to other painters. Such is the case with the grand, crowded Crucifixion (Toledo, Ohio, Toledo Museum of Art), which Wart Arslan had given to Altichiero and which I myself later attributed to the young Jacobello del Fiore; or with the series of panels with Stories of a Male Saint published by Longhi and Zeri, which appear to relate to our Veronese painter only indirectly. A final couple of examples are offered by the Crucifixion dated 1351 in the Detroit Institute of Arts and the picture of the same subject formerly in the Rasini collection in Milan, both given to the painter’s early period by Gian Lorenzo Mellini, but which should be considered the work of another Veronese painter. In this context, only the triptych with the Crucifixion and Saints in the Virginia Museum of Fine Arts, Richmond, published years ago by Giuliano Briganti, benefits from a sort of tacit agreement that makes it the only work on panel accepted by scholars as by Altichiero, for now, albeit without much conviction. With its noble, restrained eloquence, not without notes of affectionate realism steeped in an austerely neo-Giottesque idiom, the Sarti Madonna is the work that now deserves its own moment of close attention, also by virtue of the important complex to which it must have belonged. It is worth carefully rereading the essay of 1958 in which Federico Zeri brought it to public attention, so as to understand the prevailing conditions of scholarship at the time of that publication. Even if, since 1951, Pietro Toesca had succeeded in distinguishing Altichiero’s work in the Saint James Chapel in the Santo from that of the Bolognese painter Jacopo Avanzi – and Zeri himself made the honest observation that Toesca’s distinction was “the most subtle of the many put forward until now” – the critical field was far from being entirely opened up for discussion. What is more, writing in the journal directed by Roberto Longhi, Zeri could hardly ignore what the older scholar may have suggested: for Longhi, the Altichiero-Avanzi problem was far from resolved, so that any other conclusion was invalidated, and indeed his priorities regarding reviving interest in later Trecento Padua were quite different, starting with the question of Giusto de’ Menabuoi, for him to take a true interest in Altichiero, for all his greatness. In publishing the panel, Zeri had no difficulty in comparing it with certain passages of Altichiero’s frescoes in the Oratory of Saint George in Padua, where for example the Virgin and Child in the Adoration of the Magi on the inner façade closely resembles it. However, Longhi’s persistent views about the complexity of the problem of Altichiero and his collaborators meant that Zeri felt induced to rely on a activity of an assistant, identified, as we have said, as the Master of the Boi Polyptych. In addition to his authorship of the Sarti Madonna, Zeri believed that this painter – a fictitious one, as we shall see – was responsible for the beautiful fresco of the Virgin and Child, now detached, housed in the sacristy of the Eremitani in Padua, and exhibited in the same year as his article in the Da Altichiero a Pisanello exhibition in Verona with a cautious attribution to Altichiero. For Zeri, this was to be attributed instead to one of his collaborators, who was still deferential to the style of Altichiero in the Eremitani and Sarti Madonnas, subsequently evolving into a more personal language in the polyptych from Boi. In a concluding hypothesis (prompted by Longhi? ), Zeri suggested that this collaborator of Altichiero’s might be the mysterious Jacopo Avanzi. Now that we know, thanks in part to new research, that Jacopo Avanzi was an independent figure and far from subject to Altichiero, what Zeri was inferring loses a good deal of its meaning. 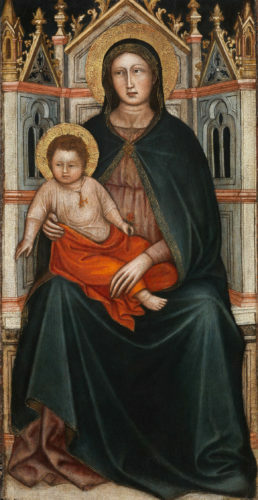 Moreover, in order to support the unity of the stylistic group he had established, the scholar underlined the evident compositional parallels between the Sarti Madonna and the Virgin in the central panel of the Boi polyptych, which was also presented at the 1958 exhibition, after conservation. In my opinion, however, these parallels are limited to compositional aspects, and do not involve the qualitative stature of the two paintings, nor their expressions of style. Even if some recent scholarship has sought to ascribe the Boi polyptych itself to Altichiero, the minute brushwork and use of simplified physiognomies (witness the rotundity of the Virgin’s face) are clear signs of a different painter, similar in some respects to Martino da Verona. The relationship with the Sarti Madonna should thus be seen through a different lens, supposing that the Master of the Boi Polyptych based himself on our work or on another very similar one by Altichiero. As for the Virgin and Child in the Eremitani, which Zeri thought was by the Master of the Boi Polyptych, albeit at a considerably earlier date, Altichiero’s authorship is now universally accepted: but in any case one would be hard pressed to attribute its subtle modulations of light to anyone but the great Veronese master, bearing in mind the comparable frescoes on the lower register of the Chapel of Saint James in the Santo. With respect to the figures of the Virgin and Child in the Boi polyptych, the Sarti Madonna conveys a much more severe monumentality, in which the rethinking of Giottesque modes – a defining feature of Altichiero’s entire output – manifests itself most clearly: suffice it to compare the rather reductive solutions of the polyptych with the marvellous play of folds in the Sarti Madonna, determined by the way the Virgin’s lilac robe and blue cloak fall over the base of the throne. On the other hand, if the type of Child and the realistic treatment of veins on his Mother’s hand seem very similar in both the Eremitani fresco and the Sarti Madonna, what strikes one in the painting before us is a greater insistence on line that (as it were) “cools” the sweet fleshiness of the first of these two works through more markedly graphic handling. This is a stylistic variant adopted by Altichiero throughout his career, seen in the frescoes of both the Saint James Chapel (1376-1379) – still touched by the gentle “Lombard” luminosity that also marked the Virgin and Child Worshipped by the Cavalli Family in Sant’Anastasia, Verona – and in the Oratory of Saint George in Padua (1379-1384), and finally in the great Crucifixion in the transept of San Zeno in Verona. In this context, paying a sort of tribute to the ever-present problem of Altichiero’s “collaborators”, Francesca d’Arcais hypothesized that the hardening of the contour line visible in the murals in the Oratory of Saint George, compared to the softer, smoother approach in the earlier Chapel of Saint James, could be justified by the intervention of an assistant, identified by her on that occasion as Jacopo da Verona. If Altichiero, like any other painter, had used assistants, it is not for us to distinguish their hands next to that of the master. As a rule, and setting aside the case of the decoration of the Chapel of Saint James in the Santo, in which Altichiero found himself having to replace Jacopo Avanzi upon his death in 1376,16 assistants are subordinate to their master, who oversees their contribution so as to ensure the uniform appearance of the work entrusted to him. Having re-established that Altichiero painted the Adoration of the Magi on the entrance wall of the Oratory of Saint George, to which we can now compare the work before us, the question of attribution it poses can be resolved more plainly – that is, by accepting his entire authorship of the Sarti Madonna. It only remains to identify the destination of this work, in which the gesture of the Christ Child, as in the Boi polyptych, alludes to the presence of a donor in the lower part of the untraced left-hand panel, and thus, originally, to a large-scale triptych.